Heading back to Kunanurra from Halls Creek, I stopped at Turkey Creek (also known as Warmun). Great for refueling, getting a snack or even sleeping in a cabin at the Roadhouse. 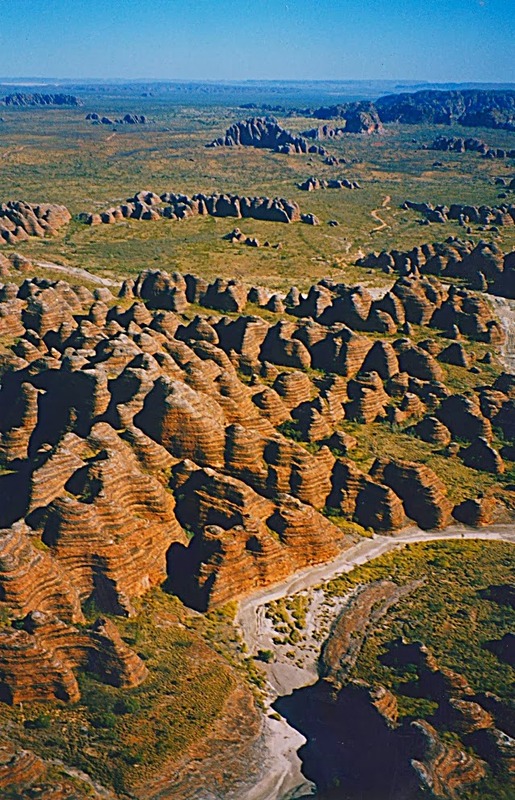 It is also where you can drive in the Bungle Bungle range in the Purnulu National park. Just saying 'The Bungle Bungles' out loud is fun, natural alliteration, and throws up fond childhood memories for me of rotund furry Wombles picking up litter and sashaying across Wimbledon common. The Bungle Bungles are actually an amazing site, unique domes of sandstone banded in orange and black layers resembling beehives, once part of a massive massif which has weathered away. This whole area was unknown until 1982, except to the local Kitja people who camped here, and regarded the ranges as an important part of their Dreamtime beliefs. Much of the Purnulu National Park is still inaccessible, except by foot, and unexplored, except by the traditional owners. Although not visible to the eye, examination of satellite images shows a seven km diameter circular indentation over the ranges. This the eroded remnant of a very ancient meteorite impact crater that hit the area some 250 million years ago, and is known as the Piccaninny impact crater. You can drive into the ranges, camp, and examine the beehives up close, when the park is open to tourists (April to November) except when the river crossing was flooded, which it was now due the recent downpours. The park ranger thought there was a possibility I could get the Toyota Landcruiser through, but there was a significant risk. There was another option, to take a helicopter from the roadhouse car park and see the Bungle Bungles from the air. Not cheap, see the latest prices on the Sling Air helicopter website. It only took 40 minutes to travel to the beehives, circle them, and fly low through the canyons, before returning to the roadhouse. It was a short but incredible view into a fascinating natural geological site in remote Australia.